More than half of the worlds oceans could change significantly in colour. Shifts in the ocean’s colour can signal significant changes to phytoplankton - tiny organisms that float on its surface - due to climate change, a new study involving the University of Southampton finds. Such colour changes can be detected by satellites orbiting the Earth, providing early warning of wide-scale changes to marine ecosystems as a result of rising global temperatures. Writing in Nature Communications, researchers report that they have developed a global model that simulates the growth and interaction of different species of phytoplankton, or algae, and how the mix of species in various marine locations will change as temperatures rise around the world. They simulated the effects global warming has on the makeup of phytoplankton and found that by the end of the century more than half of the worlds oceans will change significantly in colour. Blue regions, such as the subtropics, just north and just south of the equator, will become an even deeper blue, reflecting less phytoplankton — and life in general — in those waters, compared with today. Some regions that are greener today, such as those near the poles, may turn even deeper green, as warmer temperatures brew up larger volumes of of more diverse phytoplankton. The research was led by Stephanie Dutkiewicz at Massachusetts Institute of Technology and co-authors include Anna Hickman, Claudie Beaulieu, and Stephanie Henson of the University of Southampton. The ocean’s colour depends on how sunlight interacts with whatever is in the water. Water molecules alone absorb almost all sunlight except for the blue part of the spectrum, which is reflected back out. Hence, relatively barren open-ocean regions appear as deep blue from space. If there are any organisms in the ocean, they can absorb and reflect different wavelengths of light, depending on their individual properties. Phytoplankton contain chlorophyll, a pigment which absorbs mostly in the blue portions of sunlight to produce carbon for photosynthesis, and less in the green portions, and as such reflects more green light back out of the ocean, giving algae-rich regions a greenish hue. For around twenty years, satellites have taken continuous measurements of the ocean’s colour. Scientists have used these measurements to derive the amount of chlorophyll, and by extension, phytoplankton, in a given ocean region. But chlorophyll changes do not necessarily signal climate change, they could also be due to due to natural, weather-related events. 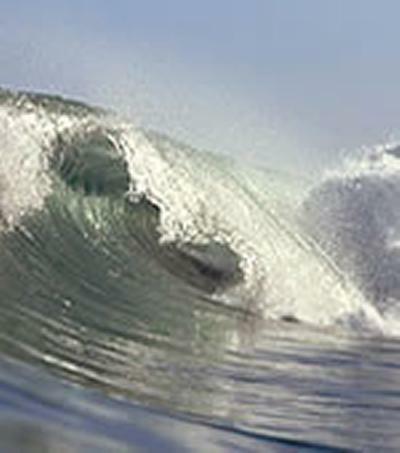 Therefore the group tweaked a computer model that it has used in the past to predict phytoplankton changes with rising temperatures. This model takes information about phytoplankton, such as what they consume and how they grow, and incorporates this information into a model that simulates the oceans' activities. They also added a new element to the model: the ability to estimate the specific wavelengths of light that are absorbed and reflected by the ocean, depending on the amount and type of organisms in a given region. When the group compared results of their model to actual measurements of reflected light that satellites had taken in the past, they found the two agreed well enough that the model could be used to predict the ocean’s colour as environmental conditions change in the future. According to this model, climate change is already changing the makeup of phytoplankton, and by extension, the colour of the oceans. By the end of the century, our blue planet may look visibly altered.